The Virgin Steele and Jack Starr fans out there certainly recognize the name of this new band. Guardians of The Flame is the new band of original Virgin Steele guitarist, Jack Starr. Jack has surrounded himself with some very talented musicians. Drummer Joe Hasselvander has seen time in both Raven and Pentagram. Vocalist Shmoulik Avigal is a former member of The Rods. And finally, bassist Ned Meloni has performed with Joe Lynn Turner and with Burning Starr. After a string of solo albums and releases under the Burning Starr moniker, Jack Starr remained silent for the last few years. Fans of classic heavy metal will be happy to know that Jack is back in action with this all new band on the Cult Metal Classics label. If you've been a fan of Jack Starr's work throughout the years, you know exactly what you will hear when you pop this CD into your stereo. Under a Savage Sky features 10 tracks of classic heavy metal much in the vein of early Virgin Steele (minus the keyboards) and Burning Starr. Naturally, the songs are built around strong, catchy riffs and plenty of shredding from Mr. Starr. Furthermore, there are some nice epic moments scattered throughout the album. Jack certainly hasn't missed a beat over the years. Recently, the first two Virgin Steele albums were reissued, and they spent quite a lot of time in my stereo. The one comparison I would derive between those two albums and this album is that Jack plays with less of a "guitar hero" mindset now that he used to. His style is still without a doubt classic 80's metal, but his solos and shreds do not in any way try to dominate the songs. Anthem For The Nations is an instrumental track in which Jack indulges himself just a little. Honestly, I am normally not a fan of most instrumental tracks. In many instances, I feel that they are placed on the albums simply to increase the running time of the album. However, this track is very deserving of a place on this album as Jack's guitar sings for itself. All the songs on this album sound very inspired, just as I expected after such a long absence. Vocalist Shmoulik Avigal's powerful and melodic voice bears a striking resemblance to Ronnie James Dio. He's not quite up to the level of Dio, but his voice fits this style of music perfectly, which is certainly why Jack brought this fellow into his band. Each of the songs on this album is easily recognizable thanks to the mature songwriting. There are no dull moments to be found, but there are also no instances where I feel blown away either. As the guys continue to work together and become more comfortable with each other, I'm sure they will be able to deliver the "knock out punch" that I am looking for. Still, Under a Savage Sky maintains a very satisfying level of quality from start to finish. Unfortunately, the production sounds very low budget, most notably with the "tinny" drum sound. This isn't problematic enough to ruin the album, although I had higher expectations. 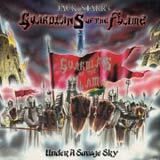 Under a Savage Sky is sure to please Jack Starr fans and fans of classic metal in general. This isn't Jack's best work, but this is still a very good release that is sure to please his fans as well as fans of the genre in general. After twenty plus years in the business, Jack still waves the flag of metal high and proud with a label that is dedicated to keeping this classic sound alive. If you like this type of release, you should check out some of the other releases from Cult Metal Classics. They are reissuing some long out of print and previously vinyl only 80's cult releases that you might be interested in.